As regular readers will know I am an advocate for wood burning stoves as an efficient and environmental friendly way of heating your home, provided of course the timber is from sustainable forests. See here and here for related articles. However it is quite difficult to find good quality dry timber for burning at home. I once visited a supplier who was trying to sell firewood that was saturated with water. When I argued that the logs were too wet, he said, with a straight face, that his customers liked it that way because it lasted longer in the fire. It is less efficient burning wet timber as either the fire will go out or a lot of heat from the fire will be wasted turning the water in the timber into steam rather than heating your home. Burning wet firewood can cause a build up of creosote in your chimney which can cause chimney fires. Wet firewood is heavy, produces a lot of smoke and makes it harder to light the fire in the first place. What’s the solution? I think it depends on your situation. 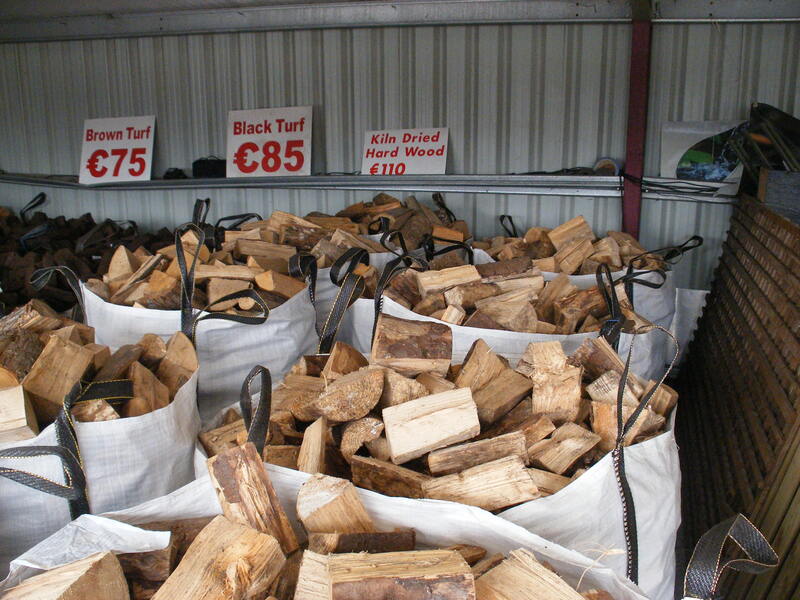 As I live in a town and have a limited amount of space to store timber, the best solution for me is to buy firewood, in reasonably large amounts for economy, from a quality supplier who seasons the wood prior to sale. Although I pay a slight premium for this I am happy as I am getting an excellent fuel supply whenever I wish. I have a choice of air dried hard wood, soft wood, black turf, brown turf or kiln dried hard wood from this supplier. I store the timber in my new (recently) constructed rain shelter ready for use. The company I use helpfully supplies the fuel ready cut in large cubic meter bags which they roll on trolleys from their truck to where ever you need it placed. Then it is simply a case of stacking the logs under the shelter ready for use. Obviously, it’s important not to stack the timber too high to avoid injury or worse from collapsing log piles. Seasoning timber yourself. However if you have the space surrounding your property, you could cut the timber and season it yourself. It can take up to 18 months so it requires a lot of space. 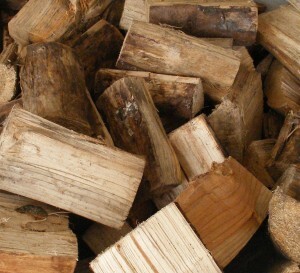 If seasoning timber yourself it is best to cut it into split logs and then arrange them in narrow stacks, which allow the wind to dry them more quickly. A rain shelter is necessary for the Irish and British climate and a dry base, but perhaps not elsewhere. How do I know my fire wood is dry? 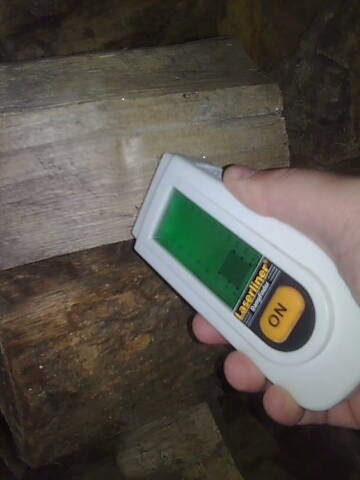 I have a moisture monitor which I can use to check the moisture content of the timber, prior to purchase. I use it for surveys during the day job also. Using a moisture meter is really the only way to be sure of the moisture content. The firewood I bought recently varies between 15% and 25% moisture content. But as not everyone has access to these devices the following are some signs that the firewood has the correct moisture content: the timber should be light, may be cracked and when knocked against a wall will have a more hollow sound than wet timber. Making sure your firewood is the right size. Timber logs are much easier to split with an axe than trying to cut in half with a saw. Therefore it is important to ensure that your supplier does not sell you logs that are too long for your stove as you will not thank him when you have to saw every log in half. Therefore you should know the width of the inside of the firebox of your stove prior to buying logs. My own preference is for relatively small logs because my stove is on the small side, but smaller logs are easier to handle and regulate the temperature of the fire with. Although the air vent helps with this also. If you are seasoning your own wood smaller logs will season quicker. Can you dry or season timber too much?In Ireland and the UK it would be difficult to air dry timber to a very low level as the moisture content of the surrounding air is relatively high by world standards. It is for this reason that I wouldn’t buy kiln dried timber. As I store the timber outside I would imagine kiln dried firewood may actually absorb moisture from the damp air surrounding it. However, some people say that you can dry timber too much. Over dried or over-seasoned wood might not burn as hot as some of the natural resins in the timber which burn hot and well will be missing. Timber will start to disintegrate after 5 to 6 years of drying and therefore firewood that has been seasoning for 2 to 3 years seems to be best. The problem I had with burning kiln-dried timber is that it simply burnt really fast! Great for starting a fire, but not economical for most uses. I’ve recently (accidentally) become the owner of about 5 tonnes of freshly felled beech and while I’m working my way through the bulk of the wood with an axe and chainsaw to season outside ready for next winter, I’m routinely using the heat from my wood burning stove to dry out cut wood stacked around its hearth. After 2 days, the weight of the cut wood is getting reduced by 30-40% depending on its cut size and it’s burning beautifully (and drying out more than enough wood to be a self-sustaining process).